It’s had a complicated history and it’s the closest that a midengine Corvette has come to production. 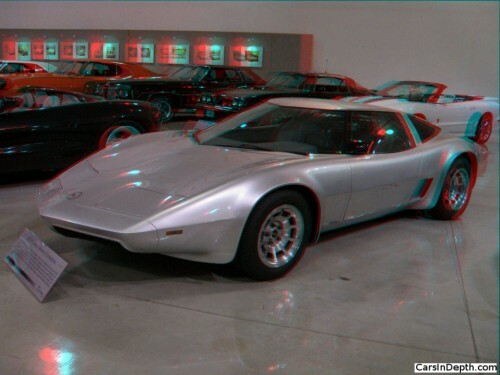 The Aerovette was first shown in 1976, though it’s a development of Zora Duntov’s XP-882 cars made in 1969. It’s also one of the most beautifully proportioned cars you’ll ever see, one of the few cars that doesn’t give away if the engine is in the front, middle or back. Even if it wasn’t one of those rare unicorns, a midengine Corvette, it would still be a stunning, beautiful automobile. Yes, Virginia, that’s a small block Chevy V8 engine sitting midships in a Corvette. A lot of people had a hand in what became the Aerovette, including Duntov and designers Bill Mitchell, Chuck Jordan, Jerry Palmer and Henry Haga. Palmer is generally credited with the Aerovette’s final shape. It’s a timeless design. If you drove it on the street, people would stare, but not because it looks like a 40 year old car. It’s as fresh as any Porsche, Ferrari or Lamborghini made today. 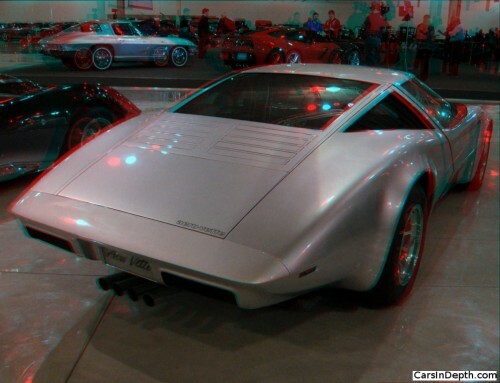 This entry was posted in 3D Imagery, 3D Photos, Chevrolet, Concept Cars, Museums and tagged Aerovette, Bill Mitchell, Corvette, General Motors Heritage Center, Jerry Palmer, Zora Arkus Duntov, Zora Duntov. Bookmark the permalink.